That’s a wrap. Day two of the Inferno Cup provided some good golf, some excitement and some bizarre events. Anthony Arvidson put on another golf clinic as he fired 68 (34/34) on the Arroyo/Lakes course combination. You might conclude that he won low gross on the day, but if you did, you’d be wrong. Anthony’s friend Ryan Dillon carded a ho-hum 32 on the Arroyo course and shot 34 on Lakes to finish the day with 66. They just edged me out of the winner’s circle by only one stroke (per hole). When you look at the card, you see only one five (#5 Lakes) and a total of eleven threes. That sounds like my total for the year. There were seven skins paid out. Again it would be reasonable to conclude that the “big boys” won them all. After all, when a gross 73 doesn’t even finish in the money, the competition’s a bit formidable. Assume as you will oh gullible ones. Tiz true Arvidson, Dillon and Rosser claimed their shares. But three of the seven went to Skyler Irvine and Nate Sanders. Skyler shot 94, but still squeezed out a skin. Nate’s moon was rising. He captured high gross with a fine 102, but left the building flush with a handful of double-sawbucks after winning two of the seven skins. Raoul Encinas won low net and dropped three birdies in the cup. He won no skins. Sometimes, life just ain’t fair. The team competition was won by Encinas, Scott (the birthday boy) Hull and Howard (how did he miss that putt) Jones. Kris Rosser, Mike Forde and Bruce Partridge finished second, two strokes back. Complete Inferno Cup standings are available on the menu bar above. 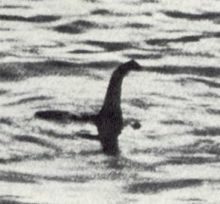 The highlight on the day came on the eighteenth hole when someone sighted what appeared to be the Loch Ness Monster. The furor subsided when it was discovered that club champion Bailey Ogrin had dropped his Scotty Cameron in the lake. Although Bailey is reputed to have more money that Bill Gates, for a three hundred dollar putter, Bailey’s going fishing. Into the lake he went. Nessie Ogrin spent his afternoon swimming. 51 Cup events still remain with your best 14 counting. Still lots of time to sign-up for the season. It runs through the end of September. The 2014 Inferno Cup is underway. The inaugural event was a rousing success. When the ship had left the launch pad, Mark Ramser and Mike Miller were at the helm finishing first and racking up 286.5 Cup points when the day was done. They tied the team of Gary Reibman and Marshall Block, but put a lock on first place with a scorecard playoff. Both Ramser and Reibman birdied the last hole, but Miller’s par edged out Block for the victory. With Reibman and Block leaving town for the summer, their second place finish in the race for the Cup was assumed by the following team. Bruce Partridge and Dale Fitzhenry moved into second after defeating George Stelmach and Tom Hansen in another scorecard playoff. 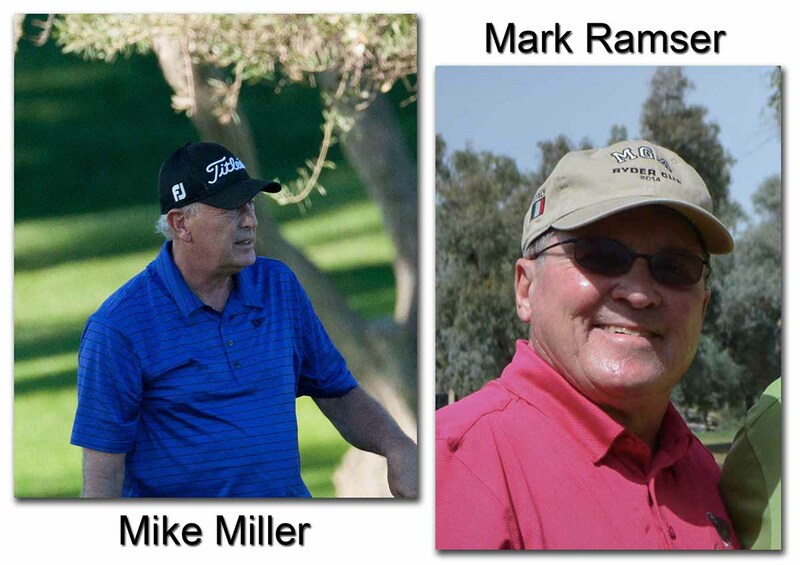 Mike Nichols and Loren Molever snatched fourth from Howard Jones and Ken Vlah in another scorecard playoff. It was a very tight and competitive field. Complete standings and Inferno Cup point totals can be seen by clicking on the menu at the top of the screen. Clearly another day when the name “Mike” gave golfer’s some magical powers. Although the course is in its summer transition condition, it remains in fairly good shape. If there are bad spirits living on the course, they live on #9 Arroyo. #7 on the Lakes course gave up its customary role as toughest on the track. It was replaced by #9 Arroyo, a hole that brought the field to its knees. With twenty golfers in the field, #9 gave up not a single birdie. The average score on the hole closer to double-bogey than it was bogey. Twenty percent of the field scored triple bogey or worse. There were three nines on the hole. There were enough balls hit into the water to raise the level of the lake an inch-and-a-half. There were ten skins paid out. Ron Dobkin and Marshall Block won two each. The other skins were shared between Mike Miller, Mike Nichols, Pat Collins (gross eagle #9 Lakes), Howard Jones, Loren Molever and Don Fruchtman. Author h. Alton JonesPosted on May 29, 2014 Categories Inferno Cup, Tournament Results, Upcoming TournamentsTags events, results2 Comments on Ignition. We have lift-off. Five, Four, Three, Two . . . The Inferno Cup competition begins Wednesday, May 28th. Come aboard for some great fun and super competition over the next four months. The Inferno Cup is for everyone. High or low handicap players are welcome. Flexible play dates mean anyone and everyone can fit the game into his schedule. Sign-up or request more information by contacting the tournament committee at InfernoCup@GaineyGolf.org. We have listened to you and spent many hours reviewing the previous Inferno Cup format. We have discovered we can make great improvements. Here they are. • Inferno Cup play now includes Saturdays. Can’t make it Wednesdays or Fridays? You can now play Saturday mornings beginning June 7th. • Greater game selection. The size of the field will usually dictate team size and game format. We’ll have a greater diversity of game formats while keeping the field level, fair and fun. • Point allocations for events have been reworked to eliminate inequalities. A system has been designed that guarantees a fair, equitable and predictable distribution of points. Everyone that plays will stand a realistic chance of winning. We will have a much larger field this year, but there will be more opportunities to compete. We have a lot of new faces and some outstanding players. It will be exciting and fun. It’s not too late to sign up. If you have golfing friends at the club that have yet to join us, please encourage them to sign up. Now with Saturday golf, even those with nine-to-five jobs can be competitive and join in the fun. For complete Inferno Cup guidelines and rules, go to www.GaineyGolf.org and select Inferno Cup from the menu or click here. Author h. Alton JonesPosted on May 24, 2014 Categories Inferno Cup, Upcoming TournamentsTags events, Rules, tournament2 Comments on Five, Four, Three, Two . . .
Last year’s Inferno Cup was a great success. This year’s will be even better. Please consider joining us. The Cup competition runs from the end of May through the end of September. Play is on Wednesdays and Fridays. Play is fast and the field is fun. This year we’ve made some great improvements to the event. • Play as many or as few rounds as you like. No limitations. • There will be much greater emphasis on making certain the playing field is level. There will be no advantages given high or low handicappers. • There will be a great diversity in game formats to maximize opportunity and enjoyment. • We’ll have the lowest of the low handicap golfers and the highest of the high handicappers. • 100% of entry fees will be paid out in prizes – all based upon your ten best finishes. • Guest friendly when possible. • No need to wait in the grill for results; they’ll be posted on the web site the same day. Golf is a gentleman’s game. Gentlemen, join us for a great season of fun and camaraderie. Entry fee: $100 payable prior to your first round of play. Contact: Mike Nichols (MNichols74@aol.com), Anthony Arvidson (anthony_arvidson@hotmail.com) or Howard Jones (howard.jones@svTempest.com) to throw your hat in the ring. Play starts May 28th. Details and rules may be found by clicking here.